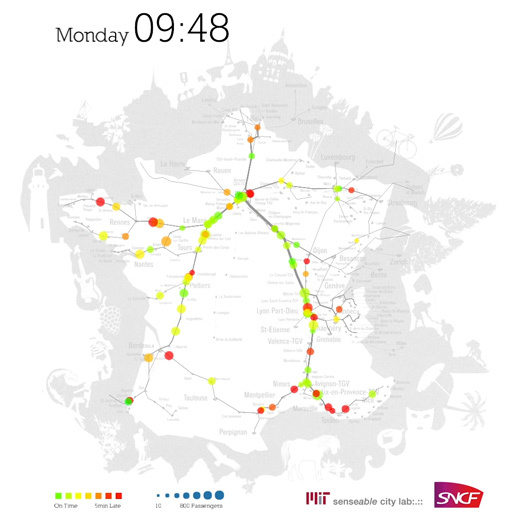 The Senseable City Lab has partnered with the SNCF division for research and innovation to investigate new ways of gaining insight into how people access different parts of France using the country's high speed railway system. Today's transportation networks are densely packed with sensors and digital systems to facilitate routine operations. 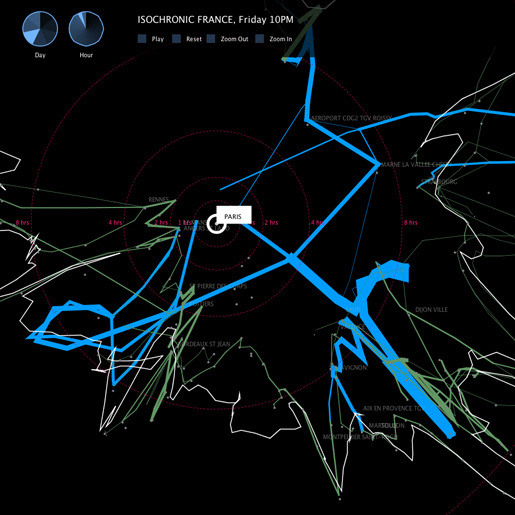 The two visual applications below combine several data sets generated by these systems to provide new perspectives on how France moves on rail. As train schedules, wait times between connections and delays vary throughout the day and over the course of a week, travel time between any location and the rest of the country changes constantly. 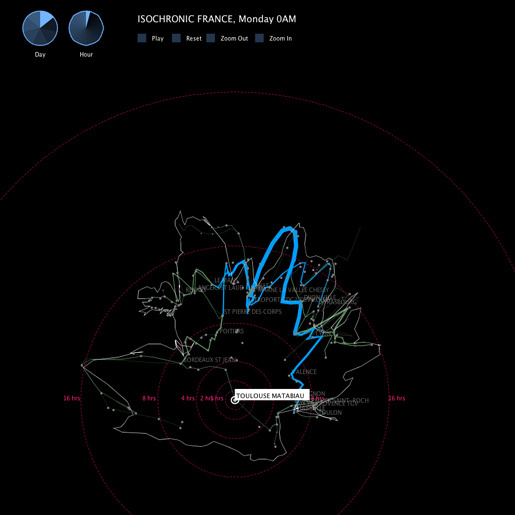 In this visualization, deformations are proportional to travel time and reveal the changes in the course of a one week period. 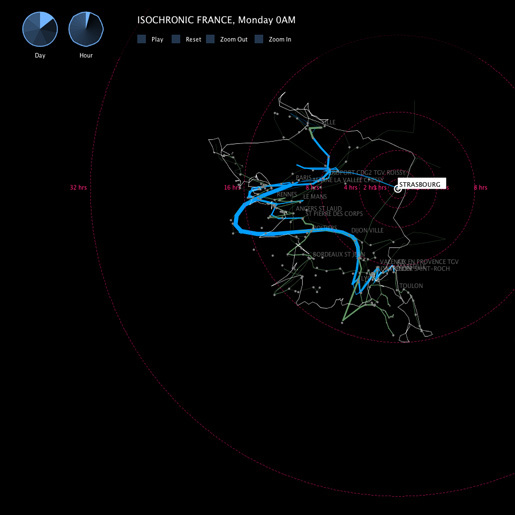 Users can select any one location as their origin to explore what cities can be reached within specific travel times. 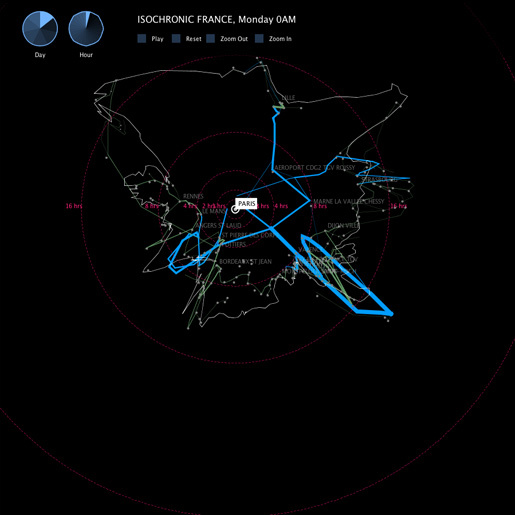 The interface allows users to access the information for a specific time or visualize this information over the course of a week. Trains, at times, do run late. While a rail network operator is interested in reducing overall delay as such, an especially critical aspect relates to the number of passengers directly affected by such delays and their location. 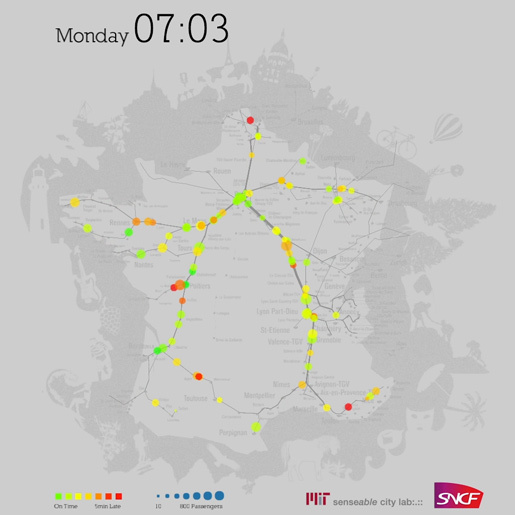 In this visualization we combine data on the time trains run behind schedule with the actual number of passengers on any train at any moment. This information is represented at the actual location of a train on SNCF’s high speed rail network. 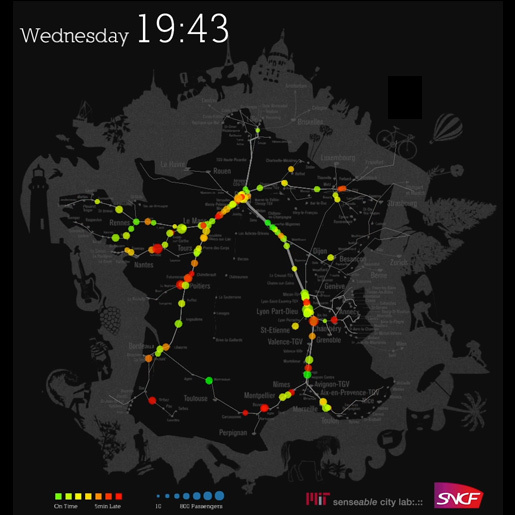 With this, a rail operator can quickly understand where many passengers are affected by train delays and use this information to take appropriate action, ultimately limiting delay per passenger and increasing overall passenger satisfaction.